Russian President Vladimir Putin said in Minsk that despite budgetary losses, Russia was ready to fully eliminate the exemptions and limitations on petroleum products within the Customs Union if other CU partners did the same. All participants in the Summit were interested in demonstrating progress in bilateral relations on issues that concern them the most. Lukashenka’s appearance in the media was successful. 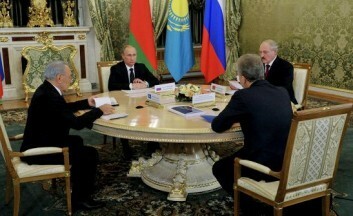 President Putin made a statement about concessions to Belarus on oil products if certain conditions were met. Belarus would have to engage more in Eurasian integration and allow Russia’s greater presence in the Belarusian economy. All summit participants were making positive statements which their EurAsEC partners would like to hear. President Putin has assured Lukashenka of certain subsidies to the Belarus’ economy, “we understand that our partners would like us to eliminate these exemptions associated with petroleum and oil and so on. We are ready [to do it]”. President Lukashenka has refuted his own statement, which he made in Mogilev the other day about the ultimate value of independence, “sovereignty is not an icon. Everything has a price. If we want a better life, we have to sacrifice something. The major issue is the people’s well-being”. Lukashenka has joined efforts with President Nazarbayev to strengthen his position and to push for common interests. Kazakh President’s statements echoed ones Lukashenko had made ahead of the Summit: “since we have an agreement, let’s create real common economic space and remove these exemptions. For example, if the Kazakhs want to pump oil to Belarus via common pipelines, they should have equal access. If Kazakhstan wants to supply its products to Russia and Europe via Kazakh, Russian or Belarusian railways, conditions should be equal”. Economic imbalances in Belarus grow day by day, and Belarus’ government wants to receive bonuses from Eurasian integration as soon as possible. However, Russia is not rushing, since time is on its side and allows waiting for concessions from Belarus. After the Summit, Russian President said, “I do not know , whether Belarus’ processing industry has the capacity to process the volumes it would like to receive in November-December. We need to hold bilateral Russo-Belarusian consultations and inside the Russian government in order to look for the most balanced solutions”. In addition, President Putin has outlined a mandatory condition for providing subsidies to Belarus: “we must state clearly that we will conduct a coordinated economic policy in key spheres”. In the near future Russia and Belarus are bound to make some mutual concessions. This includes Russia’s capital participation in the sales of some Belarusian assets. However, the deeper the integration and the closer the signing date of the Eurasian Economic Union Treaty, the more contradictions Minsk and Moscow will reveal.